I bought this skein of HandMaiden Bess at Purlescence when I was teaching there this summer, and it's a perfect match for this stitch pattern. I was disappointed to learn recently that this yarn is discontinued already. There are however several good subsctitutes out there, and it's a typical 4ply gauge (28sts to 10cm/4in) making it a good pattern for most of your hand-dyed or mill-dyed 4ply and sock! 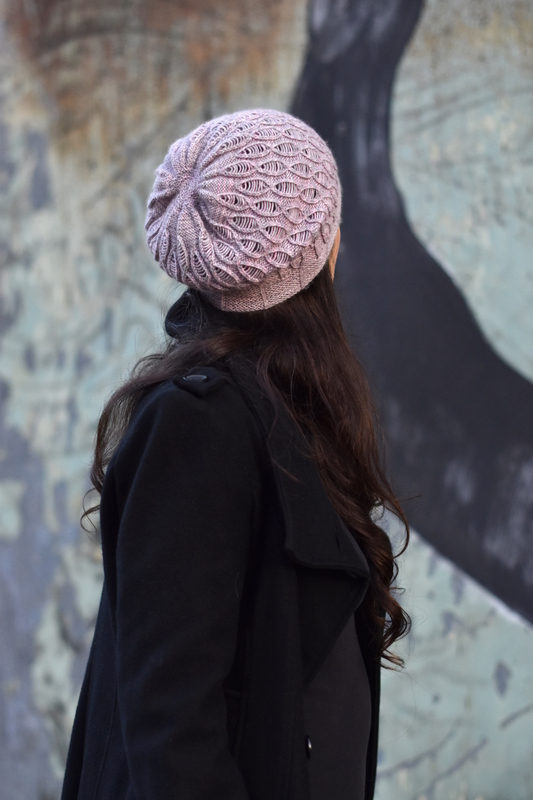 The stitch pattern consists of 1x1 cables and dropped stitches, with slipped stitches and twisted stitches to highlight the detail. If you've never worked them before, dropped stitches are serious fun. They add volume, meaning you're knitting less than you would normally need to, and there's something to very satisfying about dropping stitches and encouraging them to unravel. Not to mention that they are beautiful. And I love deconstruction as much as I love construction. 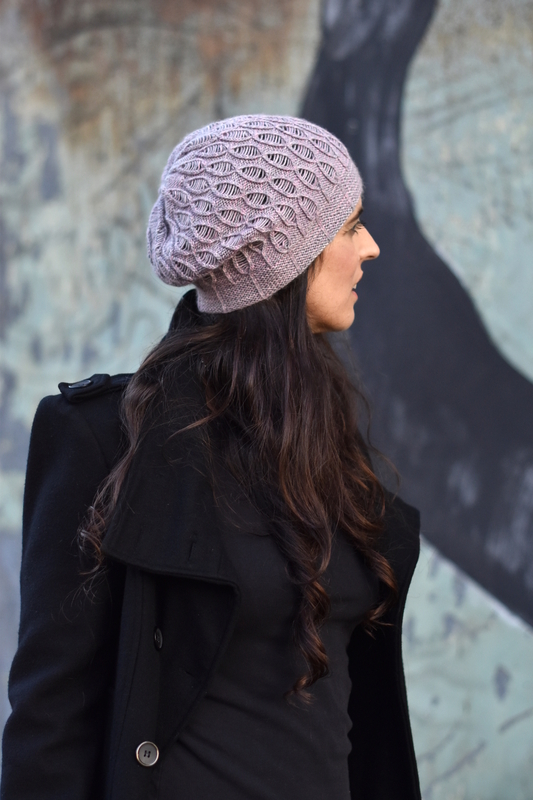 The pattern includes 2 Brim options - the garter stitch and slipped stitch option as shown, and a twisted rib Brim. Personally I prefer the look of the garter stitch, it really sccentuates the pattern; yet the twisted rib offers a different structure, and is more advisable if you intend to work with non-wool blends. 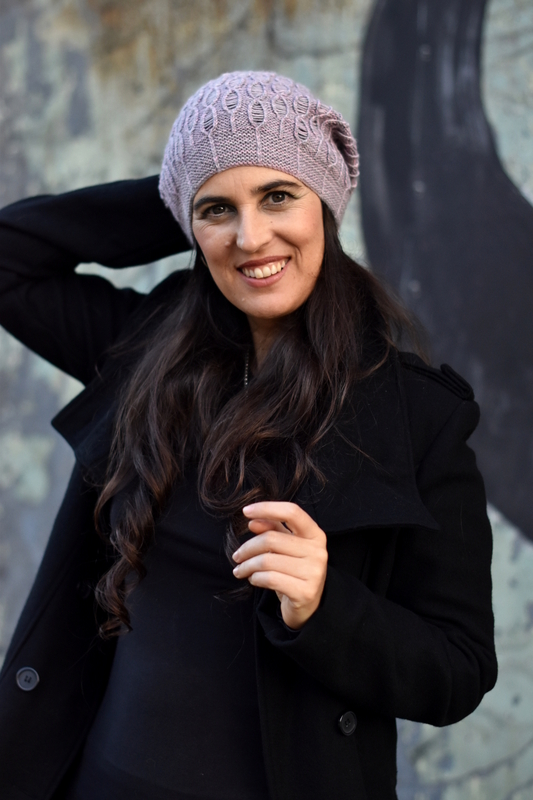 The pattern includes a full 5 sizes, making it even easier to substitute with different yarns, and comes provided in both written and charted formats. And you'll know that the pattern has been fully tested and edited, too. The pattern is named after Rosalind Franklin, and the name was suggested by Katie of Hilltop Cloud - it's the perfect name, don't you think?